I only got a BMW i8 for the weekend, so instead of taking it to a track or anything over the top like that, I decided to turn the whole experience into an extended Children’s Day, sort of. There weren’t many cars out there I wanted to drive more than the i8, but I had to wait long for my turn. I wasn’t invited to its launch event back in 2014, and being based in Hungary means it’s not like I had the U.S. press fleet at my disposal afterwards either. But while getting into those seats that retail for $149,299 on this side of the planet took a bit of organizing, at least now, I could focus on what’s the car is really about instead of writing another boring review. We told you before that the i8 is the spiritual successor to the Lamborghini Countach, and no matter where you stand on that, let’s just agree it’s a more iconic vehicle than any proper supercar out there today. It remains a bonkers concept that somehow set itself free and put on a tag to legalize that escape forever. Children have to see stuff like the i8 to get inspired and fall in love with cars just like we did back in the day looking at E-Types, Countaches, F40s and F1s. To make sure some do, I sent around an email telling everybody at Gawker Budapest that on Saturday morning, I’ll park the car in the center of the city and they are very welcome to join the party, especially if they want to bring their kids as well. What better way to spend that hour I had to spare before heading to the countryside? It was a sunny autumn day, and the good thing about putting small children in the car is that they can actually fit in the i8’s laughable back seats. Of course they will still argue about who gets to seat at the front, but if you switch to sport mode soon enough and use that peak torque of 420 lb·ft wisely, they seem to forget about the injustice soon enough. Children don’t have a healthy sense of fear, and they don’t care about the necessity of your driving license either. So, while live-blogging everything on social media with their smartphones, they will also try to persuade you into drag racing between lamps and doing skids at all intersections. Bless them. The story of how dad got out of the i8 certainly went around the following Monday at school as well. Understandably. After leaving the Budapest crowd behind, it was time to drive this futuristic hybrid both on the highway and on country roads, and after a few miles, I just couldn’t believe how refined the car is. The transition between the power sources is effortless, the gearbox is smooth and that fake but rather entertaining engine sound is reassuring in the background. If you’re used to the comfort of a 5 Series, the i8 won’t be alien to you at all. The ride comfort is roughly like in a sportier 3 Series and nothing feels beta in the cabin. The seats are comfortable, the iDrive works the same way as in any other BMW, you get a good stereo and despite all that noisy carbon fiber around, there’s no reason why you shouldn’t cross the continent in one of these as long as you can pack lightly. Journalists who took one to the track tell me it will do skids as well, and while that’s a very important quality of any sporty BMW, I see no reason you’d want to push the i8 over its comfort zone. This is a fast gran turismo, a car designed to be as economical in the city as possible before firing up all three cylinders of that heavily turbocharged Mini engine so that the real journey could began at a respectable speed. The i8 is a fast car alright. Not supercar fast of course, but once charged, the combined output of 357 horsepower and the electric torque fill will take care of its 3,273 pounds in a fun way. The next generation i8 should have about three times as much pure electric range as this car, and then BMW would have something truly special to offer. In 2015, all you get is 22 miles, and although the i8 will regenerate quite a lot on the move in Sport mode and continue to use up every last volt to save you gas at low speeds, it will never be able to get close to its claimed fuel consumption figures under normal driving conditions. Charging it from a conventional 220V outlet only takes a few hours and it’s still more economical than any other sports car on the market, but for the money, the i8 could go much further than that. 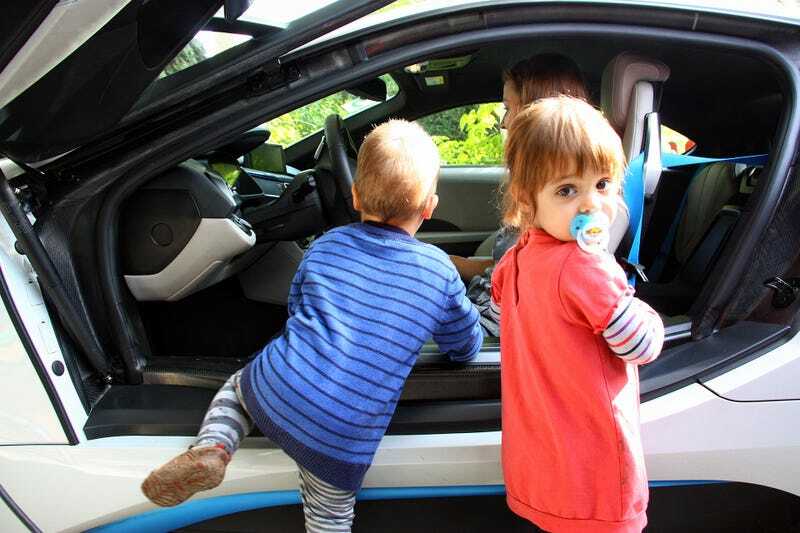 My cousin’s two-years-old twins obviously can’t understand the significance of the i8 just yet. There’s no point explaining them how BMW came up with mass-produced carbon fiber for these cars, or how they turned the whole hybrid idea into something cooler than a DB9. If I tell them that spending the extra money on an i8 is like getting an iPhone 7 before the 6 came out, they might reply “auto”. They got that part covered already. 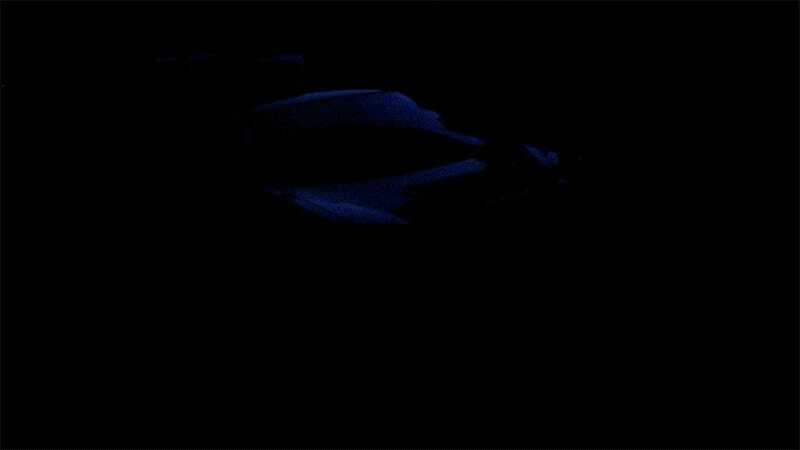 They might have also realized how shiny its wheels are, how wide and low it is compared to other cars around and how it takes a lot more effort to climb onboard through its carbon fiber door sills than in the family Renault Scenic. And what about the funny doors? Of course. They must have discovered those. Decades from now, these two will have a bunch of pictures proving that they had their fun with one of the most amazing cars of this era when they were just babies. The i8 will always be the first. Who’s the coolest uncle? That’s right!